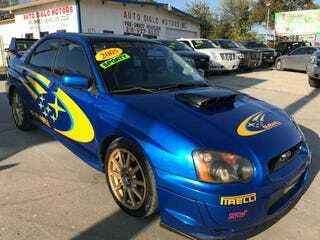 Questionable WRX at a local BHPH lot originally listed at $16,500 last month on CL. Now asking $10,900. Quite the deflation in such a short time. Somehow this lot also had multiple Pontiac Catalina’s and a MkIV Supra. And some cars with awful decals. The heck? This has to be the cheapest looking sticker I’ve ever seen on a luxury brand vehicle under 10 years old. The worst part is that it was originally listed in stock condition and then the stickers and platidip were added by the dealer at some point to try to help move it. These stickers have to have be home made. The 4Runner font isn’t even close to correct. I actually don’t hate these rims...but on a Camry? Don’t get too excited, it’s an automatic non-turbo with damn near 150k asking $24k. Has the rare (I think) tan seats which is kind of cool I guess. And a 1955 DeSoto because of course why wouldn’t this place also have an old DeSoto.